Peerless Blowers PL belt drive plenum fans are designed to operate inside field erected or factory built air handling units. The fan pressurizes the air plenum in which the fan operates. This allows air ducts in any direction to be directly connected to the air handling unit enclosure. The design saves space by eliminating the fan housing and ductwork transition to the plenum. 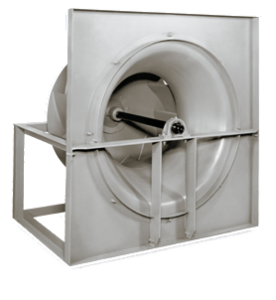 The PL plenum fan are available in wheel sizes 15 to 49″ diameters. Wheel sizes from 15 to 24-1/2″ are backward inclined, while 27″ and above have airfoil blades. Peerless Blowers plenum fan have established industry standards for design, performance and reliability. In addition, Peerless Blower’s nationwide Sales Representatives are qualified air moving professionals ready to assist you for the best possible combination of design and performance.